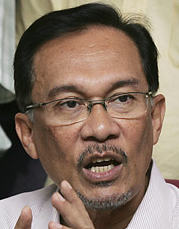 Global Muslim Brotherhood figure Anwar Ibrahim has written an article for the Malaysian media in support of a recent report on Islamophobia issued by the Council on American Islamic Relations (CAIR). According to the article. October 09, 2013 The latest report by the Council on American-Islamic Relations (Cair) – ‘Legislating Fear: Islamophobia and its Impact in the United States’ – is now available online and some of the findings are indeed alarming, underscoring a grave concern that Islamophobia is a widespread phenomenon in the US. According to the report, US based Islamophobia network’s inner core is currently comprised of at least 37 groups whose primary purpose is to promote prejudice against or hatred of Islam and Muslims. As the report shows, there is money to be made in Islamophobia. The records indicate that the inner core network is well financed, having had access to at least USD119,662,719 in total revenue between 2008 and 2011. The groups are tightly linked with key players enjoying large salaries as they encouraged the American public to fear and hate Islam. The fact that there are laws which punish hate crimes has not in the least deterred the mushrooming of such groups and with such deep pockets, it is clear that these hate groups are not about to slow down any time soon. On the contrary, as the Cair report shows, Islamophobia has insidiously crept into high places with US law makers not only being complicit in helping to spread it but some actively promoting it through legislation. Hence, the title, which is aptly called ‘legislating fear’. The fact is that between 2011 and 2013, more than 80 bills ‘designed to vilify Islamic religious practices’ were introduced in the legislatures of 32 states and the US Congress. Seven states currently have anti-Islam statutes. In other words, Islamophobia is being actively promoted by American lawmakers, particularly Republican leaders. Mainstream candidates for the Republican presidential nomination used Islamophobic rhetoric. Not surprisingly, Representatives such as Peter King (R N Y), and Michele Bachmann (R-Minn) virtually thrive on anti-Muslim rhetoric and pride themselves on being in the frontline in Islamophobic campaigns. In April the GMBDW reported that Global Muslim Brotherhood leader Youssef Qaradawi had written a letter endorsing Mr. Ibrahim for Prime Minister of Malaysia.